I walked past the very new Ergo a couple of weeks ago. It’s taken up the space previously occupied by McDonalds and has a very pared down, hipster coffee shop feel to it. We’d dragged ourselves to Marion on a Saturday in the hope of buying the toddler some new sandals. I really should have rung ahead to see if the store had new stock in because it turned out that was a fruitless venture and we were both about to tear our hair out. But at least it gave us the opportunity to try out Ergo – so new* I can’t find a Facebook page, entry in the online white pages or even a mention on the Westfield site. Still, if you’re familiar with Marion, down the Woolworths end, opposite Charlesworths and where Maccas used to be. There was an interesting selection of savoury and sweet snacks available and I was pleased to note that they weren’t all massive. So many places have such ridiculously large portions of cakes (in particular) that it just puts me off buying one. Andy chose a caramel slice (here’s a question – do you call it a caramel slice or millionaire’s shortbread?) and I opted for the chocolate brownie. Andy rated the caramel slice far above other (more giant) caramel slices available at Marion, but the toddler wasn’t so sure. The chocolate brownie, however, was absolutely delicious. Studded with walnuts, it was crispy on the outside, dense, fudgy and chocolatey on the inside. 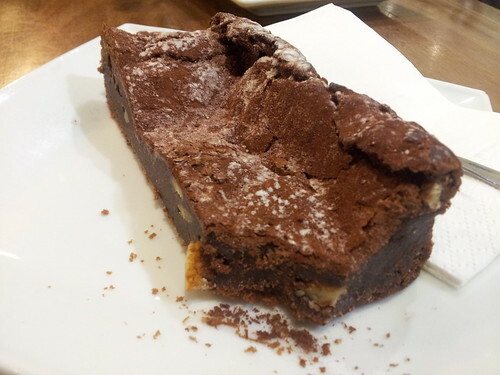 I am hesitant to say this but I think this was the best chocolate brownie I have ever eaten while out and about (clearly it is not a patch on one I might make myself!). The coffees were good and the babycino came with two very large marshmallows. This caused a great deal of excitement because the toddler thought there was just one. The surprise when he spotted the second hiding behind his cup was hilarious! Ergo is absolutely a welcome addition to the Marion café scene. * I will update this post with details as I find them.